Originally posted: August 11, 2018 . Last modified: August 11, 2018 . 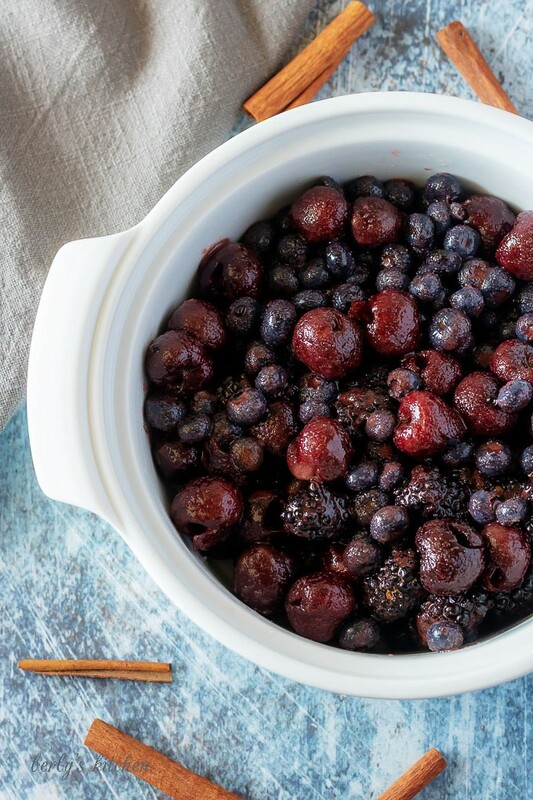 Mixed berries, cinnamon, and nutmeg are hidden under a buttery layer of crust in this mixed berry cobbler recipe. Top it with your favorite ice cream! 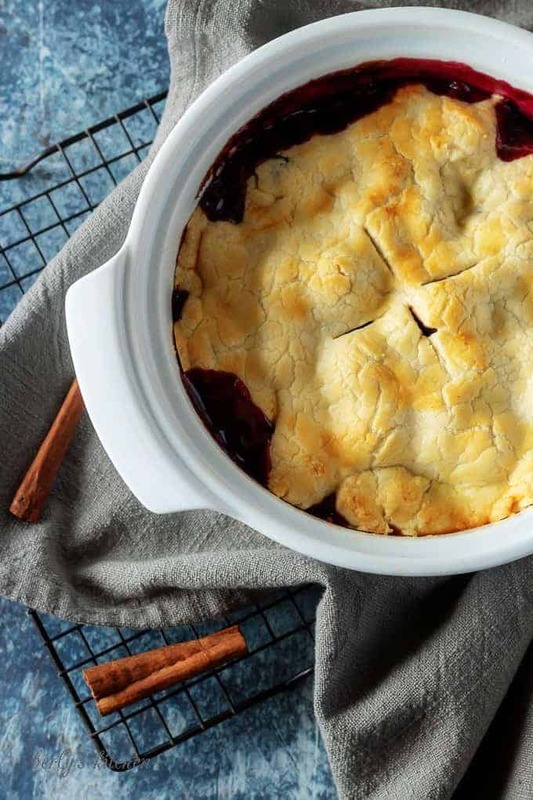 I don’t make a lot of cobblers simply because everyone in my house likes a different style of crust. John likes more of thick, dense biscuit-like crust. I prefer a flaky, buttery, pie-like crust. Kale doesn’t really like cobbler, so we usually make him an oatmeal cream pie or chocolate chip cookies. Over the weekend, I made something that required a crust and had some extra left over. John did what he does best and took my leftover crust pieces and suddenly this cute little ramekin of cobbler appeared. I couldn’t wait to share this recipe with you. 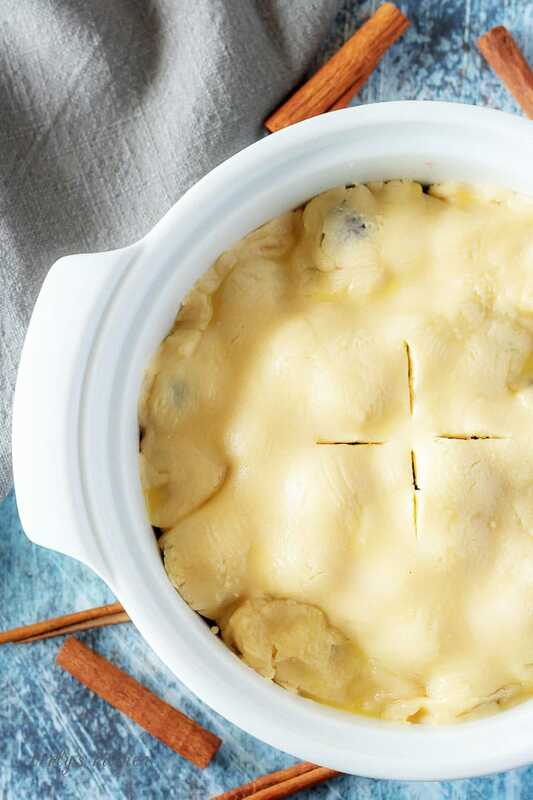 Start by preheating your oven to 375 degrees F. and grease an 8-inch baking dish. First, use a food processor to combine the flour, butter, and salt. Pulse until the mixture resembles loose sand or small pebbles. Next, slowly add the a bit of the ice water a teaspoon at a time until the flour mixture just starts to come together. Last, remove the dough from the food processor and shape into a disk. Wrap in plastic wrap and place in the refrigerator for 30 minutes. 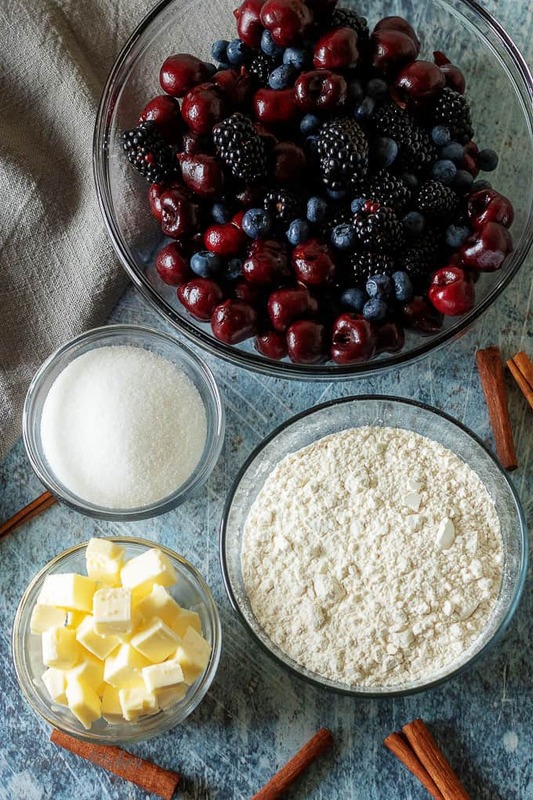 First, while the dough sets in the fridge, in a large bowl toss the berries, sugar, cornstarch, cinnamon, and salt. Next, gently combine the ingredients so the berries are evenly coated. Transfer the berries to the prepared baking dish. Now, after the 30 minutes have passed, remove the dough from the refrigerator and lightly flour the work surface and a rolling pin. Afterward, roll the dough out to approximately ½ an inch thick and carefully lay the dough over the baking dish to cover the berries. Last, trim the edges so that none is hanging over the edge. and tuck in any excess crust if desired. First, mix the egg and water together to make an egg wash. Brush the egg wash over the dough. Then cut 3 to 4 slits into the center of the dough for venting. Next, place the cobbler into the oven and bake for 35-45 minutes or until the filling is bubbly and the crust is golden brown. Last, allow the cobbler to cool for 15-20 minutes prior to serving. Add whipped cream or ice cream as a topping. If you are using frozen berries, then make you thaw them out and pat them dry. If not, your cobbler will be super runny. Be sure your counter top has been properly dusted with flour before you try and roll out the dough; otherwise, it will stick. Also, I dust the ball of dough and my rolling pin in addition to flouring the surface of my counter top. Just a quick side note, this crust is an all-purpose crust. I use it for pies and casserole type dishes. For example, it works beautifully for a chicken or beef pot pie, as well as, apple pie. Need more tasty ideas for all those Summer berries? Then check out our Homemade Blueberry Oatmeal or our Greek Yogurt Berry Smoothie! Preheat oven to 375 degrees F. and grease an 8-inch baking dish. The calories listed are an approximation based on the ingredients and a serving size of one cup. Actual calories will vary. The cobbler stores well in a sealed container on the counter top or in the refrigerator for up to 3 days. Yum! That looks really good; perfect for V Day! Thank you, Belle! It’s funny because I ended up making that cobbler for Kim and me with leftover pie crust lol! This is so perfect for Valentine’s Day. I have been looking for a dessert for the meal that I have planned, thank you so much for solving my problem! You guys always have the best recipes! I love cobbler! It’s the perfect dessert comfort food. There’s nothing better than a good cobbler! Can’t wait to make this recipe, yum! Looks delicious and I love anything Handsome and I can share. This looks like such a great dessert recipe for 2! I’ve never tried berry cobbler and I can’t wait to try it! Thank you for sharing! I just love this! What a great way to enjoy berries in the winter, too! Very romantic for Valentine’s Day ❤️ ? Thanks, Patricia! 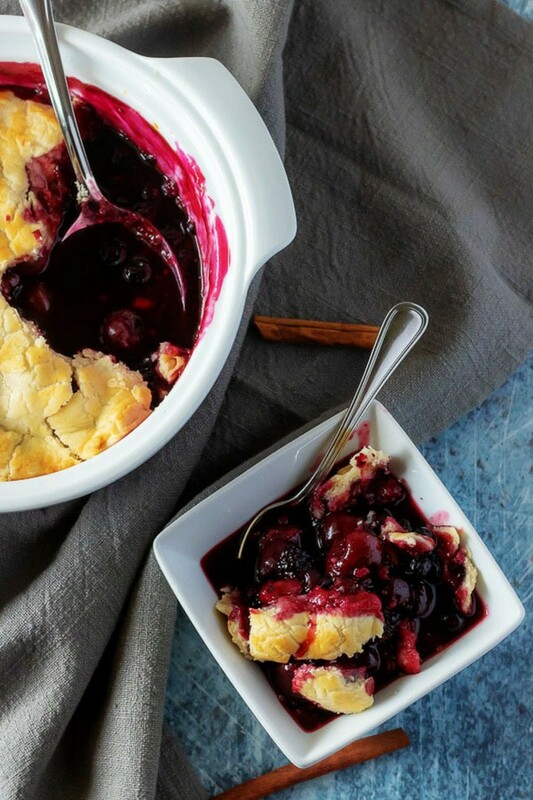 We love berry cobblers, and this was the perfect size for sharing. 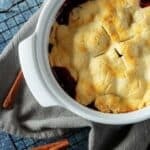 Blueberry cobbler is an all time fave! This looks amazing! Thanks, Ruthie! 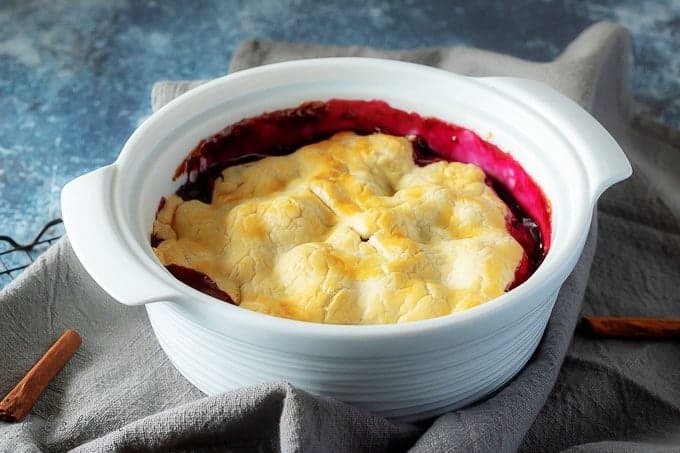 I too enjoy a great blueberry cobbler. So cute. I’d cut a heart in the top and serve it for Valentines Day!